Showing 46 articles from June 19, 2013. 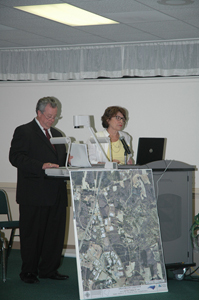 LOUISBURG — County commissioners adopted a $73.7 million budget, but not before cutting out a new library branch in Centerville and adding a bigger appropriation to an organization that fights domestic violence. Staff said they would generate discussions with the school board about improving safety, but the budget did not include extra money the school system requested to install resource officers at each school. And it didn’t include a boost for teacher supplements. FRANKLIN COUNTY — For the second time in less than a week, Franklin County was ground zero for a severe storm that tore a hole in a roof, sent a tree crashing into a house and dragged down power lines. But in both incidents, no serious injuries were reported. 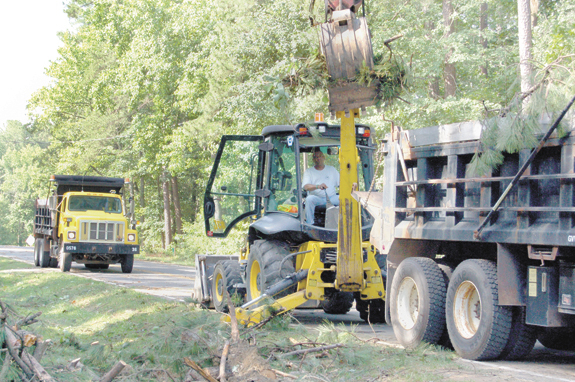 “We were fortunate,” said county Emergency Services Director Jeff Lewis. In a matter of minutes and with virtually no discussion and no public input, the Louisburg Town Council adopted its $14.1 million budget for fiscal year 2013-14 Monday night. The budget, which reflects a 2.4 percent overall increase, leaves the tax rate at 53.5 cents and includes no rate hikes for water, sewer or electricity. The sanitation rate (trash collection) will go up about 70 cents a month due to a new contract with Waste Industries. LOUISBURG — The Franklin County Board of Commissioners agreed to help a regional development organization pay off a federal debt. Commissioners had agreed to give the Kerr Tar Regional Council of Governments $74,693 — a one-time special assessment — during a meeting last month, but the payment was contingent upon each of the 21 COG members paying their share of the $311,000 debt. The Franklin Times has long prided itself on a “no holds barred” philosophy on its sometimes controversial editorial page and, beginning with this edition, adds a bit more substance to that philosophy. “We want to encourage a reasoned, articulate debate about important local topics -- and have recruited two local authors to bolster that effort,” explained Times Publisher Gary Cunard. It would be funny if it weren’t so downright scary. 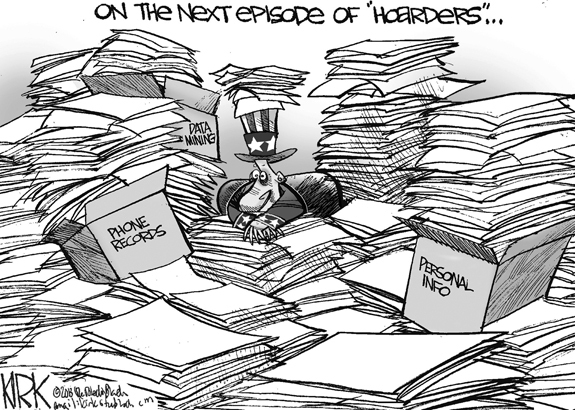 All this brouhaha over the government “listening” to phone calls, dredging for dirt on the Internet and snooping through all sorts of electronic databases raises some really disturbing questions — some of which haven’t even been asked yet. 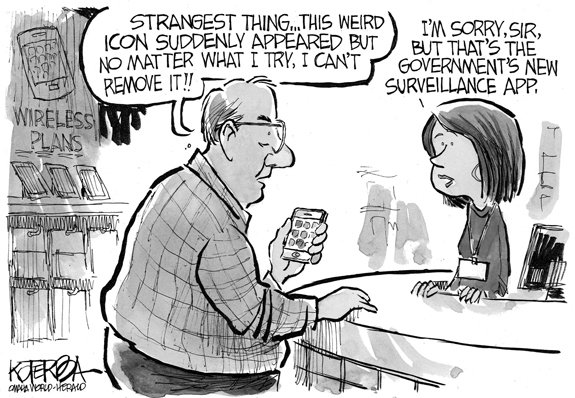 Of course, the right to privacy is paramount. 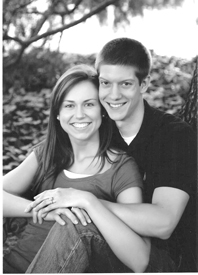 Included in this edition of your Franklin Times are the photos of the class of 2013 from Franklin County. They represent one of the best educated groups of graduating seniors who have ever received their diplomas in our county. They have high hopes, major ambition and complex plans for their futures and are well equipped to begin making those goals a reality. Sadly, most of those plans do not include staying in — or ever returning to their home county. One thing I can say about the town of Youngsville is that they sure do ask for it. Very recently, they’ve asked their residents to tell town staff and officials how they feel about the town — whether by survey, by letter or in person at forums and workshops. Well, that effort begins, again, this coming Thursday, June 27, when the town will host Envision Youngsville. It’s from 7-9 p.m.
Understanding politics: It’s all about money and how to get yours! What is the meaning of “is”; remember that? Having watched the contest to win, or better stated to buy votes I have to wonder if people really understand the end game. It is about money, your money and how to separate you from it. Hundreds of millions are spent to convince/sell us to vote and declare we are either Democrat or Republican. Most of it is provided by those that would rather not be identified. More years ago than I care to remember, I became a Democrat. The reason I did is because I believe in a progressive political philosophy. Had I registered to vote in the middle of the 19th instead of the middle of the 20th century, I would have become a Republican. LOUISBURG - James Cheek, a resident of Louisburg Nursing Center, died Wednesday, June 19, 2013 at Franklin Regional Medical Center in Louisburg. Funeral services were incomplete at press time. NORFOLK, VA - Janice Winstead McBurney of Norfolk, Va., died Thursday, May 30, 2013. A memorial service will be held at 2 p.m. Saturday, June 22, at Rock Spring Baptist Church, where the family will receive friends one hour prior to the service. 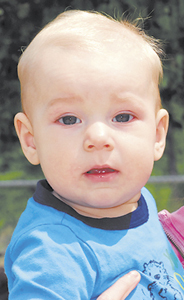 Burial will follow at Bunn Cemetery in Bunn. RALEIGH - Marie H. Bynum, 85, died Tuesday, June 18, 2013, at Rex Hospital in Raleigh. Funeral arrangements were incomplete at press time. NOT THIS TIME. Bunn’s Ian Land is tagged out at home plate during Monday night’s scholastic league home baseball matchup against Sanderson. 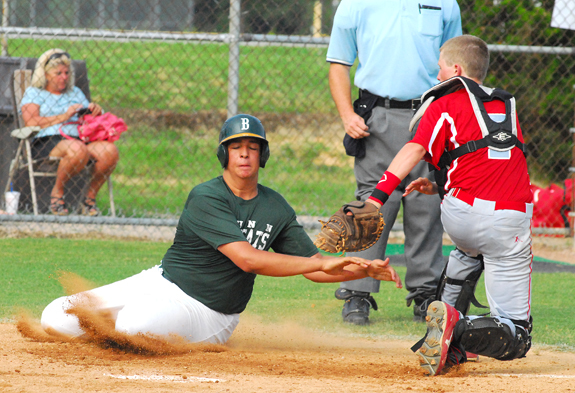 BUNN -- Leonard Allen has one eye on the scoreboard and another on development as he guides his Bunn baseball players through summer league action. Bunn has three teams of middle and high school-aged performers currently in action. The BHS Baseball Team has a group of rising seventh and eighth-graders competing in the Nash County Babe Ruth League, and that season started two weeks ago. CCMS TRACK MVP. Distance runner Ryan Fritz was selected as the Most Valuable Performer for this year’s Cedar Creek Middle School boys track and field squad. YOUNGSVILLE -- After a rare two-year hiatus, the Cedar Creek Middle School boys track and field squad is back on top of the MAC-9 Conference -- and were joined by the CCMS girls team. Cedar Creek’s tradition-rich programs swept the overall championships at the annual MAC-9 Championships, which were held last month at the Northern Vance High School Football Field in Henderson. 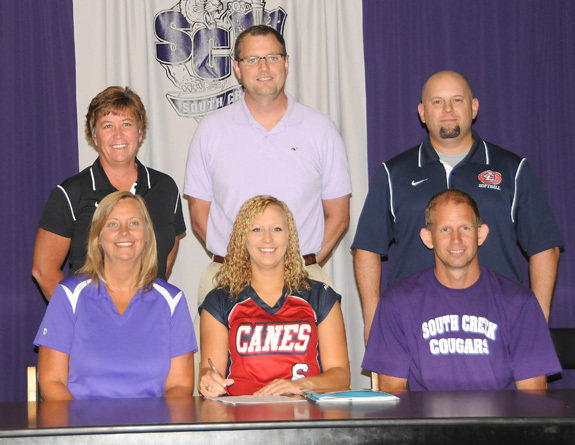 SOUTH CREEK SOFTBALL SIGNEE. 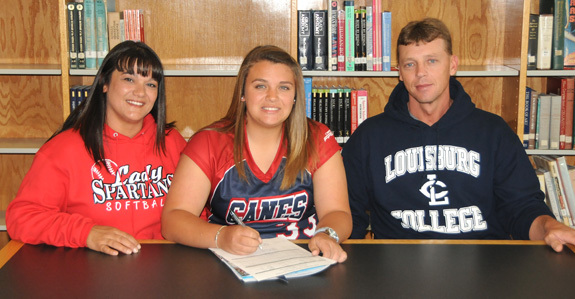 Kim Mobley, a talented catcher from South Creek High School in Robersonville, signs a letter-of-intent to join the softball program at Louisburg College. Pictured are top right is LC head fast-pitch coach Donald Stopa. LOUISBURG -- When Don Stopa became the Louisburg College softball coach two years ago, he inherited a team that was solid at the plate -- but relied mainly on one pitcher. 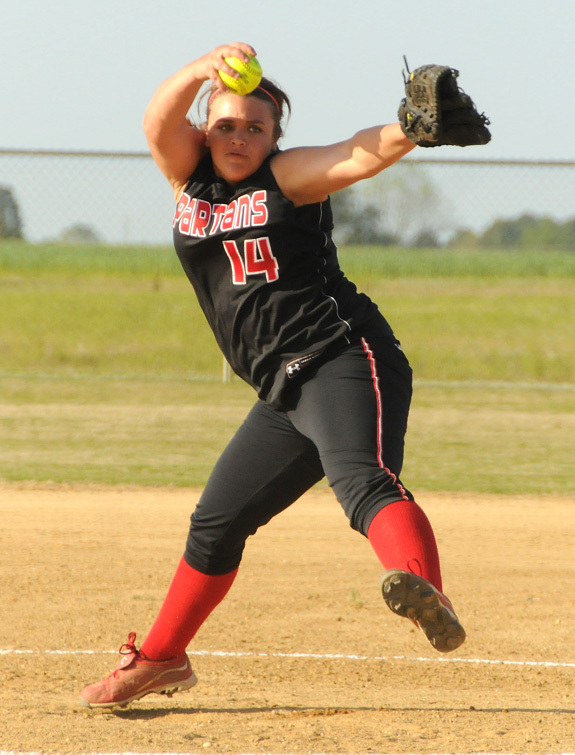 That hurler was a good one as Jamie Hockaday helped the Lady Hurricanes achieve plenty of diamond success. 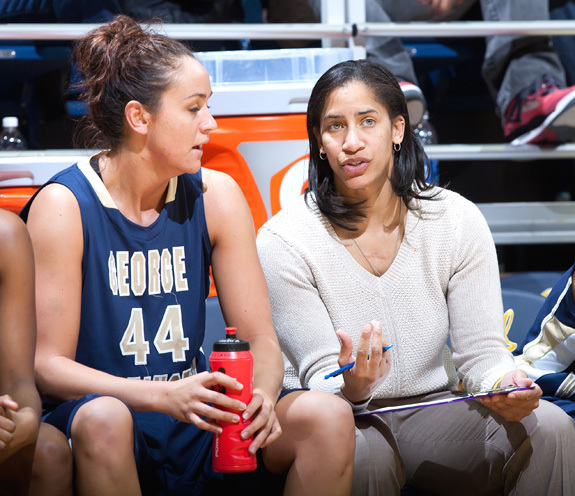 Shay Hayes’ history of success as a high school head coach and college assistant were certainly appealing to the Louisburg College women’s basketball coach search committee. But one other aspect of Hayes’ resume’ caught the eye of committee member and LC Athletic Director Mike Holloman. OMAHA, NEB. -- North Carolina State University fell 2-1 to UCLA in perhaps the most tightly contested game of the 2013 College World Series on Tuesday night at TD Ameritrade Park. The Wolfpack (50-15) scored once in the bottom of the third to take a 1-0 lead. UCLA (46-17) rallied with a pair of runs in the top of the fifth, and held the Pack scoreless the rest of the way to claim a 2-1 victory. FRANKLIN COUNTY -- The Dixie Youth Baseball Tournament season will begin this weekend with the District 10 Coach-Pitch event at the Oxford Webb High School Softball Field. Both Oxford and Youngsville will field two teams as part of the double-elimination format. Other entrants will be Warren County, Louisburg and Bunn. MYRTLE BEACH, S.C. -- Joe Maloney launched a towering, two-run home run to lift the Myrtle Beach Pelicans to a 7-5 win over the Carolina Mudcats on Sunday night at TicketReturn.com Field in a Class A Carolina League baseball showdown. The Pelicans rallied from three down to finish the first half 40-29. The Mudcats come into the All-Star break 22-48. GREENSBORO -- The 2013North Carolina Coaches Association East-West All-Star Boys Basketball Game will have a Louisburg College connection. The East Team will be guided by former Louisburg College player Bill Boyette, who competed for the Hurricanes under legendary head coach J. Enid Drake. LOUISBURG -- Coming off their best-ever season, the Louisburg College Lady Hurricanes will kick off their 2013 soccer campaign Aug. 24 against Catonsville Community College. The event will be played as part of a tournament at Cape Fear CC in Wilmington. LC, coached by Andy Stokes, won the Region X and District Championships last fall en route to making its first appearance at the NJCAA National Tournament. FRANKLIN COUNTY -- Dates and first-round pairings have been announced for this summer’s Tar Heel District 6 Youth Softball Tournaments. The Coach-Pitch event is scheduled for July 8-10 at the Carver Elementary School Field in Wendell. The 10-Under Tourney will be held June 28-30 at the Zebulon Elementary School Park. FCPR 12-OVER DIG THIS. 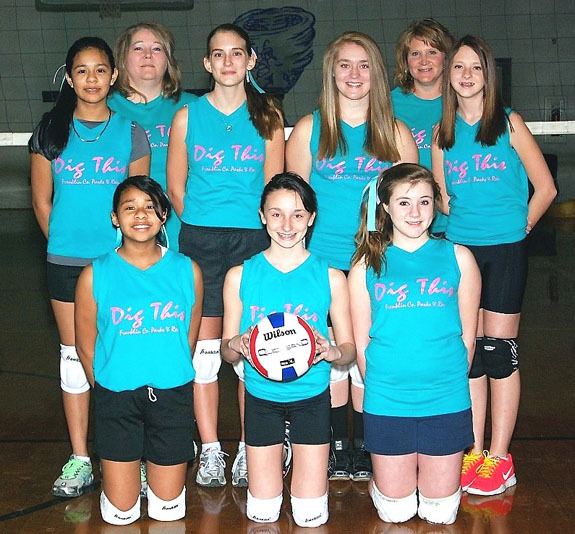 (Back, l to r) Michelle Sosa Lopez, Coach Tracey Griffin, Tori Schroeder, Linzey Griffin, Coach Marybeth Allen and Riley Allen; (front, l to r) Jessica Sosa Lopez, Abigial Choplin and Cameron Hayes. FCPR 12-OVER SPIKED PUNCH. 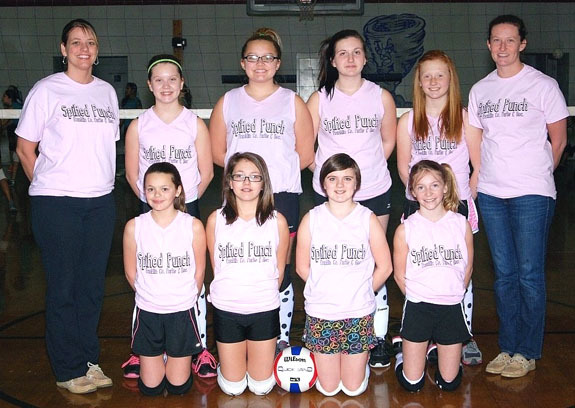 (Back, l to r) Coach Amy Bryant, Mikayla Boucher, Casey Dixon, Audrey Wilder and Coach Michelle Bryant; (front, l to r) Brooke Rice, Payton Bryant, Bre Pippen and Casey Salter. 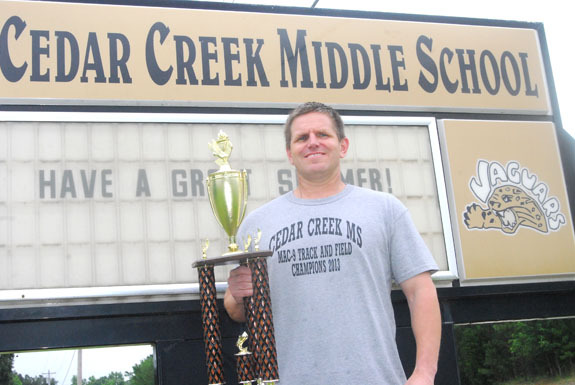 Veteran head coach Scott Bond guided the Cedar Creek Jaguars to the Middle Athletic Conference Boys Track and Field Championships during the 2013 campaign. Incoming Louisburg College signee Megon Smith has the potential to become an elite-level hurler in Region X according to Lady Hurricanes’ coach Don Stopa. Bunn batter Christian Murray executes a bunt attempt during the Wildcats’ home baseball contest Monday against scholastic league opponent Raleigh Sanderson. Union High School’s Megon Smith is joined by her parents as she signs to play softball at Louisburg College. 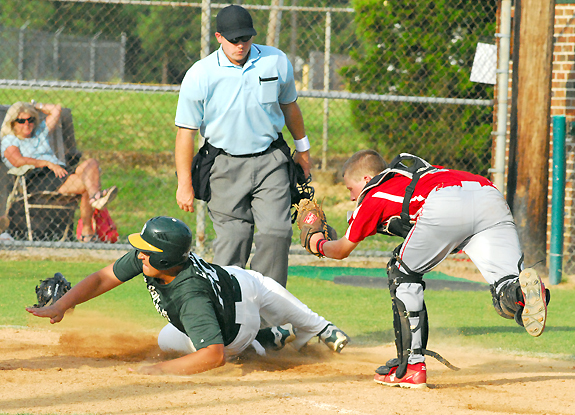 After being tagged out at home plate earlier in the game, Ian Land (left) scores a run for Bunn during last Monday’s home baseball contest against Raleigh Sanderson. A hundred plus a couple! 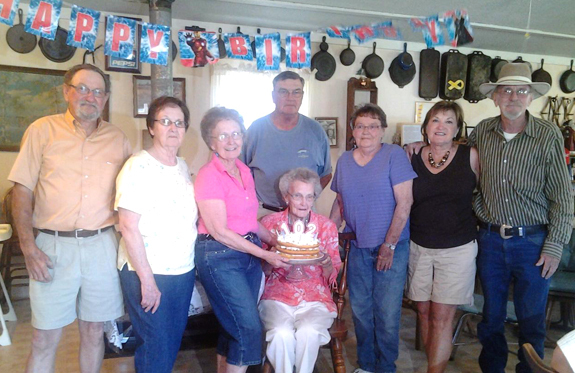 Friends and family gathered in Bunn over the weekend to celebrate a woman who pushed two years past the century mark. Mary Williams turned 102 on Friday and the community gathered for a surprise birthday party on Saturday at the home of her niece, Berteen Wilder in Bunn. GOLDEN. 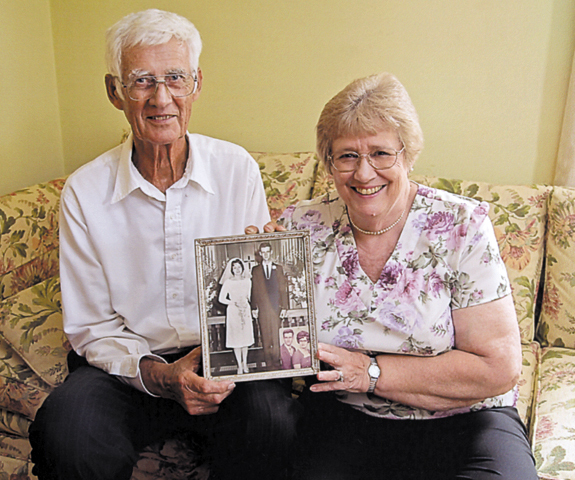 Johnny and Donald Rose McGhee celebrated their 50th Wedding Anniversary on June 9, 2013. They hosted a luncheon for 28 guests in their home. The couple drove to church in the same 1957 Chevy they drove on their honeymoon. 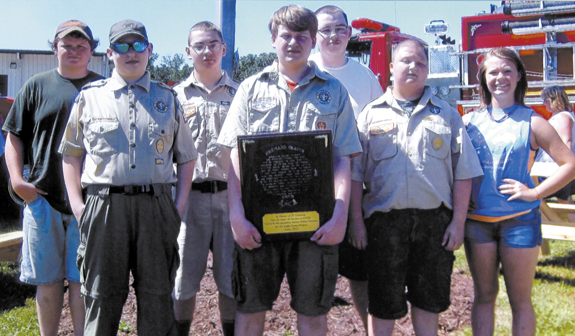 Dylan Newton, Life Scout with Troop 555 of Louisburg, completed his Eagle Project recently at the Epsom Volunteer Fire Department. Dylan, with the help of other scouts and adults, built two new picnic tables for the fire station. He learned this skill at Louisburg High School in the carpentry class. The Franklin County Board of Education made the following personnel decisions during its June meeting. The Cypress Creek Civitan Club recently presented the 2013 Connor Starling Junior Civitan Scholarship to Bunn High School seniors Brandon Thomas and Jon Jackson. The scholarship, named after the Junior Civitan charter president, is given annually to the Cypress Creek Junior Civitan senior(s) who has excelled academically and in community service. LOUISBURG — Franklin County commissioners denied a special use permit that would have allowed an Oregon family to build an aerial adventure park just outside of Youngsville. A half dozen residents, armed with petitions signed by hundreds more, convinced the board on Monday night that their quiet Bert Winston Road neighborhood wasn’t the place for such an intense operation. In addition to adopting its budget for the coming fiscal year (see related story starting on page 1a of this edition), the Louisburg Town Council plowed through a long list of relatively routine items Monday night. Youngsville authorities responded to a structure fire at a school, but it turned out to be a false alarm. According to a report by Officer A. Edwards, officers were investigating a 911 hangup call when they were dispatched to the Youngsville Elementary school in reference to a fire call. As officers approached, according to the report, light smoke could be seen, but it was not coming from the school. YOUNGSVILLE — Following a spirited debate that featured town staff looking out for taxpayers and developers looking to give the town’s Main Street a face-lift, officials agreed to endorse a grant application that a resident and building owner said will have the town looking more like a thriving neighbor. 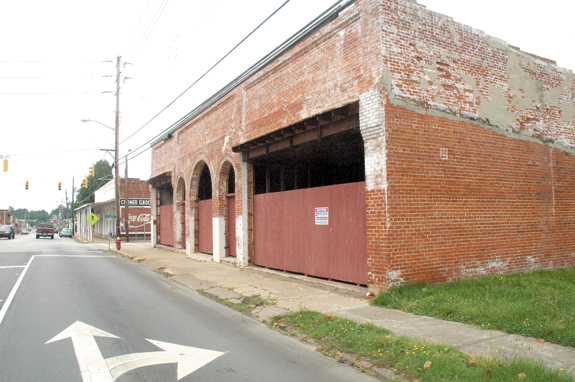 Matthew Winslow and Tim Gray presented commissioners last Thursday night with their plans to apply for a Building Reuse and Restoration Grant to renovate the Boondocks building at the corner of Main and N. Cross streets. Veterans services representatives are hosting a symposium, focusing on care after trauma. Gary M. Blue, local veterans employment representative (LVER) for Franklin, Vance, and Warren counties, and Phyllis E. Maynard, disabled American veterans service officer for the Vance County area, are sponsoring a Female Veterans Symposium 2013 “Care After Trauma,” slated for June 27 at the Vance-Granville Community College Civic Center. FRANKLINTON — Commissioners on Tuesday night approved a budget that cuts the tax rate, provides an amenable health insurance plan for employees and commissioners, and affords the town manager some funds for employee merit increases. But it didn’t come without some tension.